February 27, 2012 Broader Horizons: Kim Coble, Chicago State University, " Teaching and Research at an Urban Comprehensive University"
March 16 - 17, 2012 KICP Supernova Hub workshop: "Photometric Identification of Supernova"
March 30 - April 1, 2012 A&A @ 2012 NSTA National Conference on Science Education "At the Crossroads for Science Education"
April 2, 2012 EFI Colloquium: Don Lamb, Enrico Fermi Institute and the Department of Astronomy and Astrophysics, "Scientific Discovery Through Large-Scale Computer Simulations: Type Ia Supernovae and High Energy Density Physics Experiments"
September 26 - 28, 2012 Cosmology Short Course "Dark Matters"
October 1, 2012 EFI Colloquium: Fred Ciesla, "Planetesimal Collisions During the Birth of the Solar System"
October 6 - December 15, 2012 76th Compton Lecture Series: Thomas Davison, "Constructing the Solar System: A Smashing Success"
December 10, 2012 Joe Carson, College of Charleston, "Discovery and Characterization of the 'Super-Jupiter' Around the Late B-Type Star Kap And"
Next week as part of this series, we'll be hosting Jeff Bezaire from Jump Trading who will be speaking about his work as a quantitative trader. As a "quant" working at an electronic trading firm, I develop models and strategies for fully automated, computerized trading of futures and equities in electronic markets around the world. In this talk I'll describe what I do, different roles for quants in finance and trading (and in particular in Chicago), and why physics/astrophysics grads are particularly good at it. The short answer - teasing causal relationships out of large datasets with time-varying, non-Gaussian noise, horrible non-stationary correlated systematics, from telemetry of questionable quality, where understanding what's going on at the hardware level is important... and making it all run fast too. Meg Urry, Yale University, "Women in Science: Why So Few?" The PSD Women in Science, the Kavli Institute for Cosmological Physics, and the Department of Astronomy and Astrophysics invite you to a seminar by Prof. Meg Urry from Yale University on: Women in Science: Why So Few? on Wednesday January 18th, at 12pm noon at Kent 120. Talk: Women in Science: Why So Few? Women continue to be underrepresented in STEM fields (Science, Technology, Engineering, and Mathematics). The gender imbalance is particularly large in Physics, where fewer than 20% of college physics majors are women. Decades of research suggest this is due in large part to lower expectations and evaluations of women as leaders, thinkers, do-ers. I discuss the experimental data and outline steps that can be taken to mitigate these obstacles. Fuller participation is better for the field and better for everyone. The Society of Women in Physics (SWIP) at the University of Chicago is partnering with the Kavli Institute for Cosmological Physics (KICP) to hold a dinner for undergraduate students interested in physics. Professors and Postdocs will join students for a pizza dinner and roundtable discussion about the joys and stresses of pursing a career in physics. Broader Horizons: Kim Coble, Chicago State University, " Teaching and Research at an Urban Comprehensive University"
Have you ever wondered what it would be like to be a faculty member at a minority-serving institution? A teaching-focused university? A state-funded organization? I will describe what led me to become interested in such a position, some of the thrills and challenges, as well as the requirements for landing the job and earning tenure. 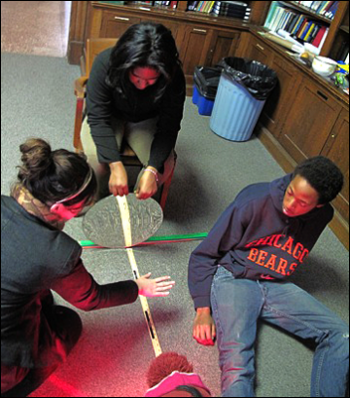 As a member of the AAS astronomy education board, I will provide tips and information on how to make your astronomy teaching more engaging and effective. Finally, I will briefly discuss the importance of astronomy education research and what led me to become involved in a project targeting student understanding of cosmology. EFI Colloquium: Rainer Weiss, MIT on behalf of the LIGO Scientific Collaboration, "Current State and Prospects for LIGO"
On Thursday 15 March, we will host the next Postdoc symposium in the LASR conference room. It will take place from 1.30 pm to 5 pm. There will be food and snacks in the beginning and pizza at the end. Craig Booth, "Feedback and Galaxy Formation: From Small Scales to Large"
Claudio Ugalde, "The Superheated Target for Astrophysics Research"
Surhud More, "How accurate is our knowledge of the galaxy bias?" Rahul Biswas, "Topics in Supernova Cosmology"
Will High, "Weak gravitational lensing by galaxy clusters in the South Pole Telescope survey"
Eduardo Rozo, "A Fully Self-Consistent Picture of Galaxy Cluster Abundances and Optical, X-ray, and SZ Scaling Relations"
KICP Supernova Hub workshop: "Photometric Identification of Supernova"
Construction continues on the Giant Magellan Telescope. The next event is the first blasting for the leveling of the top of the mountain to prepare the site for the telescope. On Friday, March 23, at 01:00 PM, Chilean Time, (11 am Central time), the First Blast (Big Bang event), will take place at Las Campanas Observatory. The live streaming is provided thanks to the courtesy and close collaboration of the US Embassy in Chile. A&A @ 2012 NSTA National Conference on Science Education "At the Crossroads for Science Education"
Louis E. Abramson, Randall H. Landsberg: "PHENOMenology: Stepping Through the Scientific Method"
Act out the scientific process as both investigator and phenomena in this interactive lab that explores the concepts of observation, inference, correlation, and causation. Randall H. Landsberg, Mark SubbaRao: "Science Visualized: The Art of Science"
Pictures and images allow all types of learners to approach and explore modern science. Experience learning with depictions of cosmological data and remote observatories. Randall H. Landsberg, Kathryn Schaffer: "ART/Science"
From zines to art installations, this collaboration between the School of the Art Institute and the University of Chicago offers unique STEM learning opportunities. EFI Colloquium: Don Lamb, Enrico Fermi Institute and the Department of Astronomy and Astrophysics, "Scientific Discovery Through Large-Scale Computer Simulations: Type Ia Supernovae and High Energy Density Physics Experiments"
The Flash Center for Computational Science is the developer of FLASH, a highly capable, fully modular and extensible radiation-hydrodynamics/MHD community code that scales to well over a hundred thousand processors. FLASH is currently being used to simulate phenomena range of scientific fields, including astrophysics, cosmology, computational fluid dynamics, plasma physics, and high energy density physics (HEDP). I first describe the challenges of exascale computing, and the Center's strategic plan for taking FLASH to the exascale. I then describe the Center's discovery of an entirely new explosion mechanism for Type Ia (thermonuclear-powered) supernovae, and its program to validate current models of these events using simulations and high-quality observational data from the SDSS Supernova Survey and the Dark Energy Survey. Finally, I describe the Center's collaboration with the High Energy Density Laboratory Astrophysics Group at the University of Oxford to use FLASH to help design, execute, and analyze HEDP experiments that are transforming our understanding of the generation and amplification of cosmic magnetic fields, and the properties of matter in the interiors of planets. John Carlstrom, "Exploring the Universe from the Bottom of the World"
We are in the middle of a revolution in our understanding of the Universe. We can finally begin to answer questions such as "How old is the Universe? How did it start? What is the Universe made of? 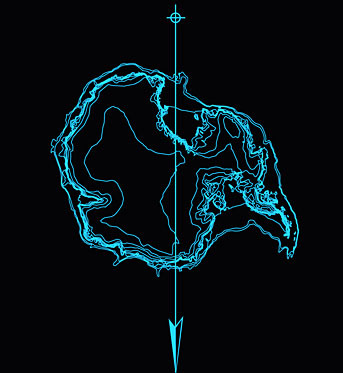 Cosmologists at the University of Chicago have been searching for answers to these questions in one of the most forbidding places on Earth: the high Antartica plateau. Dr John Carlstrom will speak about new measurements being carried out with the 10-m South Pole Telescope to test the inflation theory of the origin of the Universe and to investigate the nature of Dark Energy. The South Pole Telescope studies the Cosmic Microwave Background radiation, the fossil light from the Big Bang, providing a direct view of the Universe as it was 14 billion years ago. John E. Carlstrom is the Subramanyan Chandrasekhar Distinguished Service Professor at the University of Chicago and the deputy director of the Kavli Institute for Cosmological Physics. He received his Ph.D. in physics from the University of California at Berkeley in 1988. Dr. Carlstrom is a member of the American Academy of Arts and Sciences and the National Academy of Sciences. He has received several awards including a MacArthur Fellowship. HEP seminar: Maria Monasor, University of Chicago, "Recent Results from the Pierre Auger Observatory"
The Pierre Auger Observatory is the largest instrument (with an extension of 3000 km2) ever built to study ultra-high energy cosmic rays. The observatory, completed in 2008, has already accumulated the world's largest data set of extensive air showers developed by ultra-high energy cosmic rays using a hybrid technique that exploits the advantages of two well-stablished detection procedures. Latest results including measurements of the energy spectrum, anisotropy in the arrival directions, mass composition and hadronic interactions will be presented. Cafe Scientifique: Brad Benson, "The Ends of the Earth & the Beginning of the Universe: The Big Bang, Dark Energy & the South Pole"
Please join us as we honor Roger Hildebrand on the occasion of his 90th birthday with a special EFI Colloquium and reception to be held Monday, May 7, 2012. The event will begin at 4:00 pm with coffee/tea/cookies in room 206 of the Kersten Physics Teaching Center, 5720 South Ellis Avenue, followed by a series of short presentations in the large lecture hall, KPTC 106, about different aspects of Roger's career. We will wrap up with a reception* following the talks. We hope you and your guest will be able to join us in celebrating Roger on this occasion. Who should attend? This event will convene women scientists and engineers interested in sharing ideas and learning from leading women in - academia, industry, government, business and the nonprofit sectors - to share ideas and experiences critical for the 21st century. Francis Slakey is the Upjohn Lecturer on Physics and Public Policy at Georgetown University and an Associate Director at the American Physical Society, where his focus is the intersection of science and society. 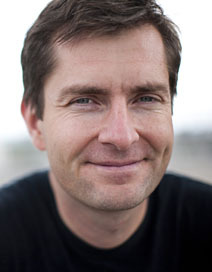 The founder and co-director of the Program on Science in the Public Interest, a Lemelson Associate of the Smithsonian Institution, and a MacArthur Scholar, Dr. Slakey has been featured by NPR, National Geographic, and others, and his writing has appeared in The Washington Post, The New York Times, Slate, and Scientific American. In recognition of his adventures, he carried the Olympic Torch from the steps of the U.S. Capitol as part of the 2002 Olympic Games. In July of 2009 he became the first person to summit the highest mountain on every continent and surf every ocean. On Friday June 1, we will host the Spring Postdoc symposium in the LASR conference room. It will take place from from 9:30 AM to 12:30 PM followed by lunch. * Yuko Kakazu, "Deep Spectroscopy of High-redshift (4 < z < 6) galaxies in the COSMOS field"
* Suman Bhattacharya, "Dark Matter Halo Profiles of Massive Clusters: Theory vs. Observations"
* Jeff Grube, "VERITAS observations of Galactic particle accelerators"
* Maria Monasor, "Microwave detection of Ultra High Energy Cosmic Rays"
* Brad Benson, "SPT-3G: Building the Science Case and the Design for the Next Generation Camera on SPT"
* Stephen Hoover, "The Birth of SPTpol"
Special colloquium: Geoff Marcy, Honorary Degree Recipient, "ExoPlanets: From Jupiters to Earths"
New observations reveal the properties of exoplanets, from Jupiter-size to Earth-size. Observations give the distribution of planet sizes, their orbital distances, and their occurrence rate around stars of different types. Over 300 multiple-planet systems have recently been discovered, offering information on the structure and gravitational interactions within planetary systems. The Kepler space telescope is now detecting planets as small as Earth, and smaller. The detection of habitable planets having temperatures suitable for biology, 0-100C, is in reach. You are cordially invited to attend the Chicago Council on Science and Technology's 2nd Annual Fundraiser "Science in the Second City"
"Discovering Alien Worlds" by Astrophysicist Edward "Rocky" Kolb, Award Ceremony, Silent Auction, Cocktails and Plated Dinner. NASA will hold a media teleconference to discuss an extraordinary galaxy cluster that is smashing several important cosmic records. * Michael McDonald, Hubble Fellow, Massachusetts Institute of Technology, Cambridge, Mass. Bradford Benson: "The Ends of the Earth & the Beginning of the Universe: The Big Bang, Dark Energy & the South Pole"
One hundred years ago humans first arrived at South Pole and for the past 20 or so years scientists have traveled there to build telescopes to study the early Universe. 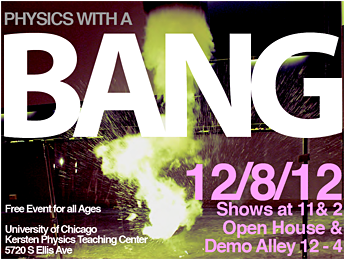 These experiments measure light left over from the Big Bang, the cosmic microwave background (CMB). They provide a unique snapshot of the infant Universe at a time when it was only ~400,000 years old, or 0.003% of its current age. These measurements and other evidence tell us that the Universe began with a Big Bang about 14 billion years ago, and that it contains only 4 percent "ordinary" matter (e.g., stars and galaxies, you and me, etc.). The rest of the Universe consists of two mysterious dark components: Dark Matter and Dark Energy. I will discuss evidence for the Big Bang, Dark Matter, and Dark Energy; the latest results from the South Pole, and what its like to work at the bottom of the world. Cosmology Short Course "Dark Matters"
EFI Colloquium: Fred Ciesla, "Planetesimal Collisions During the Birth of the Solar System"
Collisions between small bodies were frequent and energetic events during planet formation. Our recent work has shown that such events likely played important roles in the early physical and chemical evolution of asteroids and meteorite parent bodies. By understanding how impacts shaped meteorite parent bodies, we may be able to constrain the early dynamical evolution of the solar system and models for terrestrial planet formation. 76th Compton Lecture Series: Thomas Davison, "Constructing the Solar System: A Smashing Success"
The history of the Solar System is one of the oldest subjects studied by scientists - and one in which we still don't have all the answers. We now have a reasonable understanding of how the Sun and the planets formed, but there are still some parts of the story that are unexplained. Recent advances in numerical modeling, experimental techniques and astronomical observations are leading to a more thorough understanding of our Solar System's origins. Dr. Davison will discuss the current state of our understanding of the formation and evolution of the Solar System, with a particular emphasis on the fundamental role of high velocity impact processes. This is a diverse subject that encompasses elements of physics, chemistry, geology and astronomy. The discussions will cover the formation of our Sun, the building of the planets, and the effects of impacts throughout the history of the Solar System. Join the KICP as we welcome the start of a New Academic Year. Abstract: Our quest to understand the origin, evolution and make-up of the Universe has undergone dramatic and surprising advances over the last decades. Much of the progress has been driven by measurements of the cosmic microwave background radiation, the fossil light from the big bang, that provide a glimpse of the Universe as it was 14 billion years ago. By studying tiny variations in the background radiation, cosmologists have been able to test theories of the origin and evolution of the Universe, as well as determine that ordinary matter (the stuff that makes up stars and humans alike) accounts for a mere 4% of the density of the Universe, that the mysterious dark matter accounts for six times that amount, and that a still-elusive and poorly understood �dark energy� is required to make up the remaining 70% of the Universe. After reviewing how we have arrived at such startling conclusions, this talk will focus on new measurements being carried out with the 10-meter South Pole Telescope to test theories of the origin of the Universe and to investigate the nature of mysterious dark energy. Webcast with Josh Frieman, "Can a New Camera Unravel the Nature of Dark Energy?" 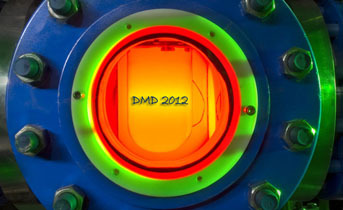 The Dark Energy Camera, constructed at the U.S. Department of Energy's Fermi National Accelerator Laboratory in Batavia, Illinois and equipped with 570 megapixels, is expected to image 300 million galaxies, 100,000 galaxy clusters and 4,000 supernovae as far as 8 billion light years away during the five-year Dark Energy Survey. The multinational project will use the data it collects to study four probes of dark energy, the mysterious and unexplained force driving the accelerated expansion of the universe. They include the study of galaxy clusters, supernovae, the large-scale clumping of galaxies and weak gravitational lensing - the phenomenon by which the light from distant galaxies is stretched and magnified by foreground clusters of galaxies. More than 120 scientists from 23 institutions in the United States, Spain, the United Kingdom, Brazil and Germany are involved in the Dark Energy Survey. On Friday Oct. 12, science writer Bruce Lieberman will ask questions from the public about the survey and the new camera that will drive it in a roundtable interview with Joshua Frieman, director of the survey and a member of the Kavli Institute for Cosmological Physics (KICP) at the University of Chicago, and Brenna Flaugher, project manager at Fermilab for the Dark Energy Camera. Cafe Scientifique: Elbert Huang, "Healthcare Reform: The Intersection of Science and Money"
Will health reform make us healthier & happier? Will it reduce costs? 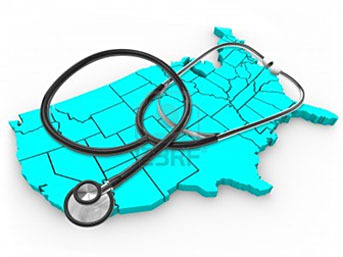 The design and study of health care policies. 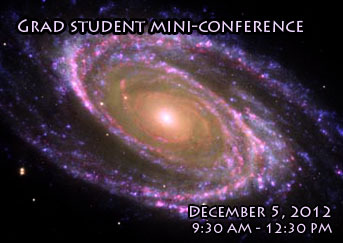 The second year graduate students in the Department of Astronomy and Astrophysics will be presenting some of their recent and proposed research projects in a mini-conference Wednesday Dec 5 from 9:30 to 12:30. You are all invited to come participate in this event. The talks will be in the LASR conference room. The talks will be 25 min with a few minutes for questions. Note there will be coffee, tea, and light snacks during a break from 10:30 to 11:00. It is perfectly fine to plan to pop in and out as your schedule allows. Alexander Kaurov, "Analytical model of reionization and observational constraints"
Dylan Hatt, "Redshift-space distortions in future sky surveys as a probe for structure formation"
Laura Kreidberg, "GJ 1214b: A Super-Earth Case Study"
Michael Florian, "Galactic Structure and Star Formation in Galaxies Between Redshifts 1 and 3"
Jonathan Richardson, "Probing Quantum Spacetime with Interferometers"
On Thursday 6 December, we will host the Fall 2012 Postdoc symposium in the LASR conference room. It will take place from 10AM pm to 12:30PM. After the talks, we will all have pizza for lunch. Keith Bechtol,"Contribution of Hadronic Processes to the Isotropic Diffuse Gamma-ray Background"
Doug Watson,"On the relation between satellite and central galaxies and their host dark matter halos since z=2"
Andrew McCann, "Giant Radio Pulses: A search for correlated incoherent emission"
Joe Carson, College of Charleston, "Discovery and Characterization of the 'Super-Jupiter' Around the Late B-Type Star Kap And"
I present the direct imaging discovery, and follow-up characterization, of the 'Super-Jupiter' around the B9-type star Kap And. Orbiting at a projected separation of 55 AU, the newly discovered super-Jupiter has a model-dependent mass ~12.8 Jupiter masses, and a temperature ~1700 K. The object was discovered over the course of the Subaru SEEDS survey. The host star's estimated mass (2.4-2.5 Msun) places it among the most massive stars ever known to harbor an extrasolar planet or low mass brown dwarf. In addition to summarizing system characteristics, I discuss some of the implications for planet formation as well as ongoing photometric and spectroscopic observations. Special EFI Seminar: Pedro Facal, University of Chicago, "Radio-detection of ultra high energy cosmic rays"
The detection of ultra high energy cosmic rays using microwave radiation is a promising technique that could be used to complement and expand the capabilities of cosmic ray observatories. The Pierre Auger collaboration is running an ambitious R&D program to study the microwave emission in air showers and to determine if it will be a viable road for a future observatory expansion. I will review this program, focusing on MIDAS, our prototype telescope that, after a successful run at Chicago, is now installed at the Auger Observatory in Malargue. I will also show how what we have learned in R&D projects for ultra high energy cosmic rays can be put to good use for the study of lower energy cosmic rays and, especially, gamma rays.